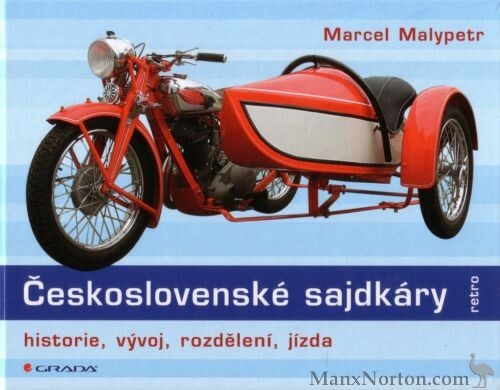 This hardcover book with Czech text on the history of Czechoslovakian sidecars written by Marcel Malypetr, was published in the Czech Republic in 2011. The book has 172 pages and 198 b/w photos plus 25 in colour. The book measures 17cm x 22cm. The chapters look at the history and development of sidecars up to WWII; different designs and mountings; an A-Z history of Czech sidecars, featuring the following manufacturers - Aero, BAF, Breitfeld-Danek, Cechie-Bohmerland, CZ, Druzeta, ERA, Favorit, Fousek, Itar, JAC, Laurin & Klement, MC, Motex, Orion, Praga, Premier, Prochazka, Tacheci, TAP, Tatra, Tlustos, Trnka, Tuma; The book includes a chapter dedicated to Velorex - typ 560/561, typ 562, typ 700, typ 563/565; There are also sections on current manufacturers - Kobras, Velorexport, Sidecarmont; Although written in Czech, this book would make an excellent addition to the enthusiast's library.